The 2015 Lenten Season begins. “From dust you have come and to dust you shall return” are the words we hear as millions of Christians receive the ashes. They are daubed on our foreheads or hands in the shape of a cross. Many enter Lent making plans for a specific “Lenten discipline” (something like giving up deserts, increasing prayer time or fasting at least one day a week). And, with it goes the prayer that we will do better with our Lenten discipline that we did with that New Year’s resolution made just 45 days ago and already broken. As we enter Lent, on the first two days, we are met with not one but two major speeches by President Obama. He speaks on terrorism or as he would have it “violent extremism.” He says that “we are not at war with Islam; rather we are at war with those who have perverted Islam.” I agree. In the background, the chattering classes have been quick to argue that he should use the language of “radical Islam” to talk about the the barbaric, inhumane and extreme actions against innocents by ISIS or ISIL in the Middle East. I don’t pretend to be a foreign policy expert. Even so, I remember the mistakes our nation made following the tragedy of 9/11. In my view we were led into an extended war in Iraq and Afghanistan that was fueled too much by revenge and too little by knowledge. We allowed understandable but blind retribution propel the U.S.A. into war. We now can see the terrible price of the last fifteen years in terms of human casualties and wasted treasure. Some at the time warned of an inevitable “blow-back” that would result. As we rushed to war I was a part of a minority who felt engaging in Iraq was misguided. My opposition was in large measure related to the failure to follow the long established ethical guidelines for a just war (proportionality of response, clarity of purpose, authority, prospect for winning, protecting noncombatants). I remember being invited to speak at a seminar in San Diego on Ash Wednesday in 2002. Nervous, I was even more on pins and needles when I discovered that the room was full of active and retired military brass. Still I proceeded to speak about the ethical realities when considering military engagement. I need not to have worried. The folks in the room were way ahead of me. You see, I learned that those who face the reality of warfare are more thoughtful and careful about these matters. They not only took to my rather tepid presentation on Just War Theory. They appreciated it. They also spoke in private conversations about the challenges of fighting our perceived enemies on multiple fronts. They also spoke of the differences between Sunni and Shiite sects in Islam and of our sloppy language and analysis. We as a nation were long on emotion and short on facts. I am not certain we have learned much in the intervening decade. I have more Muslim friends and have been privileged to know several Imams who encourage their followers in practices that are decidedly open and respectful of persons from other faiths. Still, in too many ways the current talk of war with ISIS seems strangely like the situation we faced in 2001. One of the reasons I won’t be using the words “radical Islam” is that many of the people who are encouraging us to do so wouldn’t think of insisting that we speak of “radical Judaism” or “radical Christianity.” These folks, often encouraged by Christian leaders like Franklin Graham, paint Islam as entirely evil and see us in a great battle of civilizations. These “Fanatical, Apocalyptic Christians” believe these are the end times. They suggest that we are facing an inevitable encounter with the evils of Islam. This is the mirror image of the view of “Fanatical, Apocalyptic Muslims” ready to establish a caliphate. What do those of us who are not fanatics and do not accept such apocalyptic notions of the future have to bring? I remember a phone call to an Imam, a man I didn’t know, back in 2002. “I hear that the children of your mosque are living in fear as they walk to school. Might we help?” It was the beginning of a remarkable friendship. During this Lent, I will give up easy, sloppy language and foolish images about those who differ in their faith. More I will commit to giving time to study. Military engagement seems to be inevitable in the Middle East. I reluctantly understand this. The Israeli novelist Amos Oz has written a fine essay “How to Cure a Fanatic” (Princeton University Press, 2004). He writes: “Fanaticism is older than Islam, older than Christianity, older than Judaism, older than any state or any government, or any political system, older than any ideology or faith in the world… Who would have thought that the twentieth century would be immediately followed by the eleventh century?” (pp. 41-42). Amos Oz speaks of the value of imagination and humor in the face of such evil. The volume ends with an interview in which he speaks of the Order of a Teaspoon (pp. 93ff). Faced with a calamity, say a conflagration, Oz says there are three responses we may have: 1) run away; 2) Get angry, march in protest, blame others and seek to remove leaders from office; or, 3) grab a bucket of water and throw it on the fire. And if you don’t have a bucket? Bring a glass of water. And if you don’t have a glass? Bring a teaspoon. The fire is huge but we can bring what we can. Our teaspoons may be the language we select, the prayers we pray, the letters we write, the hands we reach out to greet, the knowledge we seek. This Lenten season, my discipline will be to bring all of the teaspoons and glasses and buckets I can to put out the flames. Others may have to fight against evil in far away places; they may sacrifice their lives. A new novel by Harper Lee. Stunning news. There she is, pictured on the front page of sections in today’s New York Times and USA Today. Unbelievably, a previously written novel now has been discovered. Written before To Kill a Mockingbird, and rumored to have existed for many years, it has been found. The new novel, titled Go Set a Watchman, will be out in July 2015. Only recently discovered among other documents, the news story suggests that even Miss Lee did not know this novel still existed. It was written prior to, and with source material for, To Kill a Mockingbird. What does this have to do with the Amerson’s 2015 tour through the south? Well — everything and nothing — I guess. We were able to visit with many wonderful friends along the way. I will only mention one by name, Thomas Lane Butts. Tom lives in a town in southern Alabama, Monroeville. We stopped for a delightful visit with Hilda and Tom on January 12, 2015. Monroeville, you puzzle? Yes, some of you are already making the connection with Miss Harper Lee, she too lives in Monroeville. In fact, Dr. Butts and Harper Lee are longtime friends. For years they would meet for breakfast every Thursday at the Hardees in town. Harper Lee was known for her reclusive ways but among her most trusted friends are the Butts. When you visit Monroeville you feel as if you have walked right into the fictional Maycomb County of the novel. 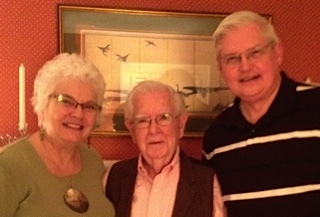 Thomas Lane Butts has been a remarkable friend to Elaine and me over the years. He has been one of my mentors. He is a great preacher — to my knowledge no other preacher’s sermons were more often featured on the national radio program The Protestant Hour. His commitments to the civil rights struggles meant that he often took courageous stands during the early days of his ministry. As a result was often overlooked, ridiculed and even punished by religious and denominational leaders. Tom is, for me, a giant. I chuckle when I say this. He is great in spirit and in intellect although he is short in physical stature. I write about him today because he represents so many exceptional southerners we have been privileged to know. I knew Tom long before I became president of Garrett-Evangelical Theological Seminary and was pleased to discover after my appointment to that post that Tom was a graduate. In fact, he finished a masters degree in pastoral counseling in Evanston before returning to the south and many years of courageous sacrifice in the service of racial justice. If you want to hear more of Tom’s remarkable story you can find the sermon he preached at Garrett-Evangelical in the fall of 2013 on the school’s website: (http://www.garrett.edu/gmedia/pdf/communications/Thomas_Lane_Butts_Sermon_Nov_2013.pdf). The movie Selma was playing as we traveled across the southern states. We took time to see it one evening along the way. I was reminded of the many great folks who sought racial justice in the past — and who still act with courage and vision. On our southern tour we visited so many of them. We visited with friends who work at the Open Door community, a ministry modeled in the Catholic Worker tradition that offers shelter and clothing for the homeless and gives witness against the death penalty in Atlanta. There were university deans providing remarkable leadership and preparing a new generation of community, religious and academic leaders. There was a bishop who is doing amazing work that opens new vistas for the church in Texas. We spent time with a medical doctor who is extending the availability of health care to the poor across the southeastern U.S. and a psychiatric social worker who provides creative new ways for mental healing. There were teachers, preachers, engineers and preschool teachers along the way. There was the board chair of a Fortune 500 company and a retired school teacher who drives elderly friends to the grocery each week. Encouragement Even Helps a Rat! As you can tell, there will be whimsy and challenge, critique and compliment in the postings ahead. Perhaps you would like to follow this post regularly? There is now a “tag” along the right edge allowing you to do this. Perhaps you will share this with friends. We traveled south in January. Logical, if you live in the north. I will not regale you with the details of our seventeen day trip; unfamiliar as I am with social media, I am enough aware to understand this is not a twitter note or Facebook page. Suffice it to say that we visited the Presidential Museums/Libraries in Georgia, Texas and Arkansas. Five in all — and more. 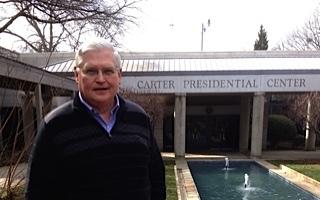 Starting with the Carter museum in Atlanta. We got our “passport” to the “modern” presidential museums, thirteen in all beginning with Herbert Hoover, right through George W. Bush. Our hope, of course is to visit all thirteen in the next year or so — and, this will prepare us for the Obama Library/Museum we hope will be located in Chicago. The presidential museums were fine. Lots of history — as presented in ways that were generally favorable to the president being honored. Understandable, of course. Still, I came away from some of the visits, not all, wondering if there could be any acknowledgement of the mistakes, the shortcomings, the poor decisions of those men — all men at this point. In fact, I remember leaving one such museum with the feeling that this fella had been dealt an inside straight at birth and lived his whole life thinking he was a great poker player. Lest I be misunderstood, there were things noteworthy about each of the presidents. The experience reinforced the sense that we are fortunate — the “American experiment” has continued to provide a remarkable gift to many. And, it leaves room for us to continually seek improvement! Among these five libraries – Carter, Bush 41, LBJ, Bush 43 and Clinton, our favorite was the LBJ Library. One is able to hear tape-recordings of Johnson and many other leaders of his day. There is no hiding of his greatest failure — the extension of the Vietnam War. There is also beautiful evidence of his courage and commitments to civil rights and a more just society. He was a man who knew how to weld power — but who also was able to grow and change. However, the best of the presidential centers was not in the five we had scheduled. On the way home from Little Rock to La Porte we decided to stay over in Springfield, Illinois and visit the new Lincoln museum. It is exceptionally well done. Don’t miss it. In Atlanta we also visited the new Center for Human and Civil Rights. It too is a spectacular way to spend an afternoon. We were also fortunate to fly out to Scottsdale, AZ for a few days. Again, we found a museum-you-must-not-miss. It is the little publicized but increasingly popular Museum of Musical Instruments in Scottsdale. Not only a remarkable collection of instruments but also forms of music from nations around the world. You will be amazed and to see/hear everything would take several days. Museums, Libraries and Centers — all good, some great; however, the real reason for our travels was the people, friends we have known over the years. Another post will come soon — maybe today — about these people. This is a rapid overview of our tour. We got off before the heavy snows came and drove across the south never paying more than $1.90 for a gallon of gasoline. This in itself was miraculous. And, we returned just home just in time for the BLIZZARD OF 2015! Eighteen (18) inches of snow over a two day period in La Porte! Yes, the new snow blower was great. As you can tell, there will be whimsy and challenge, critique and compliment in the postings ahead. Perhaps you would like to follow this post regularly? There is now a “tag” along the right edge allowing you to do this. Perhaps you will share this with friends. I know that I still owe you a more substantial reflection on the two movies Calvary and The Overnighters. Soon.